SKF recently released their lever-action coupler. 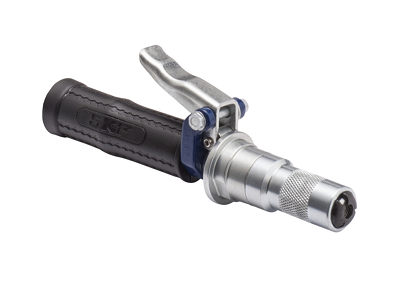 Developed to optimise grease gun lubricant delivery, this coupler is available in two versions – one for battery-powered grease guns and one for manual grease guns. The lever-action coupler tool improves safety and simplifies the manual lubrication process. Featuring one-handed operation, the easy-to-use coupler remains attached to the fitting without being held in place. In addition, its reverse-jaw design holds the fitting securely to the seat for less grease spillage. Offering a comfortable, ergonomic design, the lever-action coupler has a flexible rubber sleeve that offsets pressure applied to the lever and protects the hose from unnecessary wear. Also, its durable, all-steel construction delivers long service life. It enables one-handed operation for improved safety and is easy to use. The lever is activated for quick attachment and release from the fitting. It is a comfortable, ergonomic design with a protective grip and optimises lubricant delivery. It reduces grease spillage and is made of a robust, all-steel construction. The lever-action coupler is suitable for use with all manual greasing tools and solves common problems encountered when using a flexible hose. Typical applications include agriculture, construction and general industry, as well as vehicle service environments.